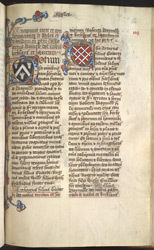 Made for Abbot William Dalton of Furness Abbey, Lancashire, the cartulary collects all the documents, such as deeds, papal bulls , charters, and grants, pertaining to the monastery. The result is called the 'Coucher' or 'Cowcher'. It probably was produced at Furness Abbey itself, in a period when manuscripts were often produced in urban workshops. Furness was a Cistercian monastery and as such was remote because of the order's ideal of isolation. The provincial surroundings, however, did not deter the ambitious project. A single artist painted generalised 'portraits' to decorate about twenty-five of the initials or beginning letters of selected texts. The pictures only give types of kings, archbishops, laypeople, etc., and usually have some approximate reference to the document following. The artist was aware of contemporary styles but painted in a somewhat less sophisticated technique than the best painters in the major centres. The heavy brushstrokes detract from the delicate shading of the archbishop's face in the initial on this page. The charters on this page are introduced with letters bearing the coats of arms of the benefactors.